Tourists flock to Amazonian jungle lodges hoping to find monkeys, toucans, and jaguars, but most of the animals they see are insects. Especially, ants. The Amazon region contains more than 1,000 species, many still formally undescribed, and they basically run the place. The leafcutter ants and their fungi are the forest’s premiere herbivores, the army ants are an ever-present apex predator, the others are scavengers, soil-churners, predators, and partners in the defense of numerous jungle plants. The jungle without ants would be a different, depauperate place. Because every rainforest adventurer encounters ants, and because no decent guides exist to help general naturalists identify the more common species, I have created the following bestiary of Amazonian ants. I do not- and cannot- illustrate all those that occur in the region. I can, however, cover the formicids most likely to be noticed by a casual visitor. This massive ant (20-25mm) is the Amazon’s most infamous, as its sting is extraordinarily painful. Beware a tendency of local guides to tell you any large ant is a bullet ant, though. True Paraponera has a rugged appearance, with two blunt horns at the top of the thorax, fuzzy yellow hairs on the forelegs, and clean indentations around the eye to receive the retracted antennae. Bullet ants nest in soil at the base of trees, yet walk all the way up to the canopy to gather food; watch for them on tree trunks. These large (10mm) attractive insects like to hang out on low vegetation, often near eye level. This habit makes them among the most visible of Amazonian ants. Ectatomma tuberculatum is light reddish brown in color with craggy body sculpture and an almost hunchbacked appearance. Workers frequently gather honeydew from sap-feeding insects and carry it between their open mandibles. Odontomachus trap-jaw ants are medium-large (6-15mm) with an unmistakable “hammerhead” appearance when the distinctive jaws are held open. The trap snaps shut on a hair trigger. Color and size vary among the several Amazonian species, but all are slender, with a single well defined segment making up the waist, and oddly long mandibles that emerge from the center of the head. Be wary of handling Odontomachus as workers can pack a painful sting. These attractive hunting ants are often mistaken for bullet ants. Pachycondyla villosa is not as big, however, but it also carries a sting best avoided. This species nests in rotting wood and dead tree branches. The body is large, waspish and slender, and the base color is reddish to black but covered by dense, shimmering golden hairs. A beautiful insect most frequently seen hunting alone on the forest floor. Pachycondyla apicalis is large (10-12mm), with bulging eyes, greyish-black in color with a dull velvety sheen. Notably, the antennal tips are bright yellow. In the field this ant’s movements are jumpy and the antennae flick rapidly like a wasp’s. A delightful mimic of Pachycondyla apicalis, the preceding species. Gigantiops is similar to its model in size, movement, and color, including the yellow antennal tips, but has long legs and massive eyes that take up the entire side of the head. It is frequently seen skipping about the forest floor. In spite of a foreboding Latin name, Gigantiops destructor is a skittish, timid ant that does not sting. Dozens of difficult-to-identify representatives of this worldwide genus are common in the Amazon. Camponotus varies greatly in size (3mm-15mm) and color (yellow more common for night-active species; brown and black for day-active species). All have a single waist segment , and most a characteristically curved thoracic profile. These ants are frequently seen tending honeydew-producing insects or gathering nectar from plants. These large insects are unlikely to be confused with any other species. Workers in a colony can vary in size and shape, but all have a dense covering of brilliant golden or silvery hairs over a black body, a sharp ridge down the back of their thorax, slightly flattened hind legs, and a tendency to walk with the gaster tucked under the body. Trails of leggy, pale ants in the genus Camponotus are common at night, and Camponotus atriceps is among the most abundant of the nocturnal species. Workers come in a variety of sizes and colors, but most C. atriceps are light in color and their bodies are covered in dense, long, standing hairs. These unusual trap-jaw ants live in trees. The heart-shaped head, honey color, straight jaws, protruding eyes, and long spines make Daceton unlikely to be mistaken for any other insect. (photo of a preserved specimen taken from the marvelous antweb.org). The tree-dwelling genus Cephalotes contains dozens of Amazonian species, but one- C. atratus– is big, conspicuous, and common nearly everywhere. These large ants (5-10mm) look as though molded from smooth black plastic, with a flattened head and long spines emerging from the middle body section. The back legs are flattened, presumably an adaptation for gliding back to the tree trunk if knocked from the forest canopy. While they look mean turtle ants can’t sting, and away from their nests they are relatively docile. Ants of this diverse genus are common worldwide. Crematogaster species range in color from yellow to black or bicolored, but most are small in size, with an unmistakable heart-shaped gaster attached on its top (not front) side to the preceding waist segment. This unusual form allows acrobat ants to point the tip of their abdomen forward over the top of the body. Pheidole holds more species than any other ant genus in the Amazon. Most are small (2-6 mm) inconspicuous inhabitants of soil and rotting wood. The dominant surface-foraging species likely to be seen in the open patrol large territories and will often find food left unattended. All Pheidole can be recognized by the slender, two-segmented waist and the presence of two distinct size classes of workers, the larger with massive, blocky heads. Leafcutters are possibly the most obvious ants to rainforest newcomers, and the ants’ busy highways are ubiquitous. Atta and Acromyrmex are large (3-12mm), generally reddish in color, with long legs, a slender two-segmented waist, and a thorax bearing several pairs of spines. The obvious giveaway, though, is that leafcutters are the only ants you’ll see carrying pieces of freshly-cut vegetation. The ants don’t eat the leaves themselves; rather, they are fungivores and the leaves are fed to an edible underground fungus. With a hand lens, you can differentiate the two genera by counting the pairs of spines on the middle body section: Atta has 3 pairs (as seen in the picture above); Acromyrmex has 4. Eciton burchellii is the classic Amazonian army ant famous for massive predatory swarm raids. Like all army ants, this species is nomadic. Soldiers are over 10mm long and sport round, whitish heads and ice tong mandibles. Workers are smaller and darker in color. The waist is two-segmented. Eciton burchellii is a generalist predator of arthropods and small vertebrates; tales of human consumption are greatly overstated. Still, be careful not to step in their trails, as the ants are aggressive and are quick to sting. Eciton hamatum provides an illuminating contrast to the related E. burchellii. This species also has soldiers with ice-tong mandibles, but E. hamatum is less aggressive, raiding in tidy columns rather than swarms. Workers of this species are uniformly yellow/orange in color. Eciton hamatum preys mostly on wasps, bees, and other ants. This medium-sized (3-10mm) army ant is smaller than Eciton, but the swarm fronts are equally spectacular. Labidus praedator is brownish black and shiny, nearly always seen in great numbers. Nomamyrmex is a spectacular insect and the most heavily-armored of the army ants. These walking tanks have shorter, bulkier appendages than the similarly-sized Eciton. Nomamyrmex prefers to eat other ants, especially leafcutters, carpenter ants, and other well-armed opponents. Colonies lack a separate soldier caste– so all workers are more or less the same shape, and the first antennal segment (the long one) is especially thick, nearly a third as wide as long. These sprightly ants come in a range of colors and sizes (3mm-12mm), but all are easily recognized by their elongate shape, short legs, large eyes, and the narrow waist with the second segment much broader than the first. Pseudomyrmex moves in a characteristic wasplike fashion. Most species nest in hollow twigs and plant stems, while a few engage in highly specialized mutualistic relationships with their host plants. Fierce aztec ants are ubiquitous in the trees of South American forests. Species vary in color and size, but most Azteca are small (3-5mm), with a single waist segment, and smell of rotting coconut when crushed. These aggressive insects do not sting, but when provoked they bite generously. Many species have highly specialized ecological relationships with plants they inhabit, some build impressive carton nests, larger than a basketball, typically hung from tree branches. This medium-sized (4mm) black species is frequently encountered in groups or trails of many nestmate ants together. Dolichoderus bispinosus can be recognized by the dense coating of golden hairs, a single spine-bearing waist-segment, a broad head, and forward-pointing spines on the “shoulders”. Dolichoderus attelaboides is large (6-10 mm), reddish-black, and unusually gangly. This common species is recognizable by the elongate neck, stretched-out thorax, single-segmented waist, and heavily sculptured body. As a word of caution, not everything in the Amazon that looks like an ant is one! Termites (top left) are ant-like in their social behavior but are actually relatives of cockroaches. They lack the narrow ant waist. Various bugs (top right) mimic ants, as do a diversity of spiders (bottom left and right). Ant Course 2013 in Peru. For those serious about learning Amazonian ants, this intensive 10-day taxonomy course will take you well beyond my simplified blog post. The Ants of Tiputini. A faunal survey of a particularly rich patch of Ecuadorian Amazon. Methodological note: my 22-species list was assembled after sorting through thousands of Flickr photographs to determine which ants were catching the eye of Amazonian visitors, complemented with a dash of my experiences in Ecuador. Thanks, Bob. Any suggestions for obvious ants I’ve left out? It would be even better if the ant names were in alphabetically. This is great, Alex! It could make a handy ring-bound flip chart for sale at a reasonable price to Neotropical nature guides and their guide-ees. A few ever-present ants from in and around buildings, such as Tapinoma melanocephalum, Paratrechina longicornis & Wasmmannia auropunctata might also be thrown in. Oh yeah, and… fire ants! This will become handy when I’m on my trips, since I like to know what I see, but I believe the bullet ants from Colombia is bigger. Or are they not the same? They call them Congas. This is excellent. How about an entry for the other Cephalotes species, since C. atratus is really quite different in size and appearance from the other turtle ants. Awesome work, Alex! I would suggest the inclusion of Brachymyrmex, Hypoponera and Strumigenys, pretty common Neotropical ants too. Rodolfo- I would definitely include those small ants in a guide aimed for entomologists. But the present post is for general tourists who aren’t necessarily looking for ants. Those folks aren’t likely to notice the small, litter-dwelling ants. Oh, my mistake! Of course, I totally agree with you. So, let me try again: Cephalotes clypeatus (a very conspicuous species – taking up JasonC.’s suggestion) and Pachycondyla marginata (or another giant and black ponerine, like Dinoponera gigantea). Yeah, I think C. clypeatus in particular would be a good one to add. A quick question: why do so many tropical ants sting, while those in Boreal latitudes never do? That might be a quick question, Vladimir, but it’ll be anything but a simple answer! Some boreal ants- particularly Myrmica– do sting, but most species aren’t any good at it. 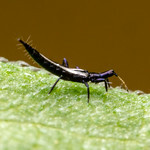 I wrote about a related topic here: http://scienceblogs.com/photosynthesis/2009/05/09/why-do-only-some-ants-sting/ , but it’s slightly different from the tropical/temperate/boreal issue. Nice post, Alex! It’s helpful to see all of these ants together after the past few years of absorbing anty knowledge from this site in piecemeal fashion. I recognize many of them and will compare to a few more ant photos from northern Argentina that I haven’t yet tried to ID. I should do something like this for eastern and/or Great Plains tiger beetles – although I think many readers probably already have better familiarity with these than with Neotropical ants. I remember dropping Cephalotes atratus from a canopy platform and watching them glide down. I then saw Daceton and did the same. Just before I picked it up, I paused and looked at my guide. I then grabbed it and sure enough it bit in. My guide smiled and just mentioned that they’re known to draw blood. They also seemed to do the gliding behaviour though. I think this is going to be a frequent behavior of ants living in any canopy environment. I’d love to see some mention of Gigantiops fantastic visual navigational ability. Lovely video, Oropendola. Your ant is Cephalotes atratus, one of the gliding turtle ants. very nice post, look a this suite http://www.kuda.ua and go to travel. good luck! I have an interest in cactus and it has been suggested that ants may play a part in seed dispersal. What are your thoughts on this and do you have any idea which species of Ant this may be. Thank you. I grew up in Peru and for a long time didn’t know the English names for these various ants. Some I have still not identified (like the pucacura). In English we actually called the tiger ant a cousin isula, since they look similar. (Isula is the bullet ant). 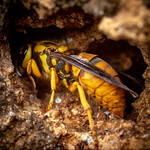 I was stung by three of these back home in Ecuador, I had trap jaw ants in my backyard that I used to feed and play with, eventually the poison sting hurt less each time lol. I was fascinated at how their jaws “click” and snap closed, it tickled. Now the hormiga tigre.. they’re big! and of course played with them and got stung, my finger was numb for a half hour and it throbbed so badly. They’re very aggressive. The leaf cutter ants can be seen everywhere, so adorable watching them carry huge chunks of leaves, I would help them out and give them some.